This is a multi-timeframe version of the popular Hull Moving Average (HMA). 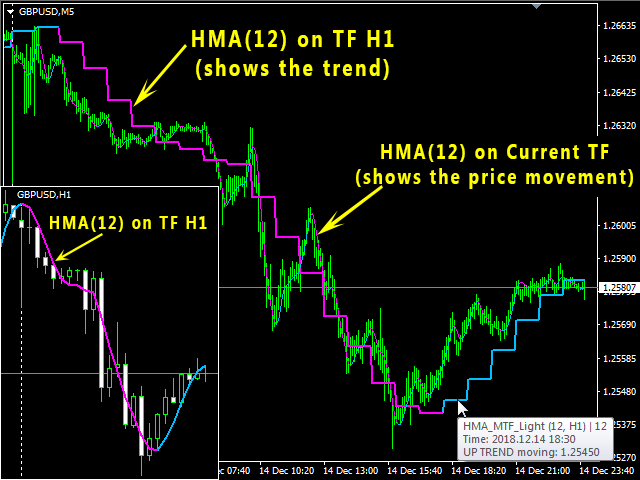 The Double HMA MTF Light indicator combines two timeframes on a single chart. The HMA of the higher timeframe defines the trend, and the HMA of the current timeframe defines short-term price movements. The indicator is freely distributed and hasn't audio signals or messages. Its main function is the visualization of price movements. If you need advanced functionality of the HMA multi-timeframe indicator (information about the HMA indicator readings on all timeframes, convenient visual signals of entry points, audio and text messages, send to e-mail and mobile devices), try the Double HMA MTF indicator. Offset of Higher TF relative to Current TF (can be >0 or =0) - shift of the higher timeframe relative to the current one for the HMA indicator. The value can be greater or equal to 0. The 1 value means higher by 1, 2 - higher by 2 etc. 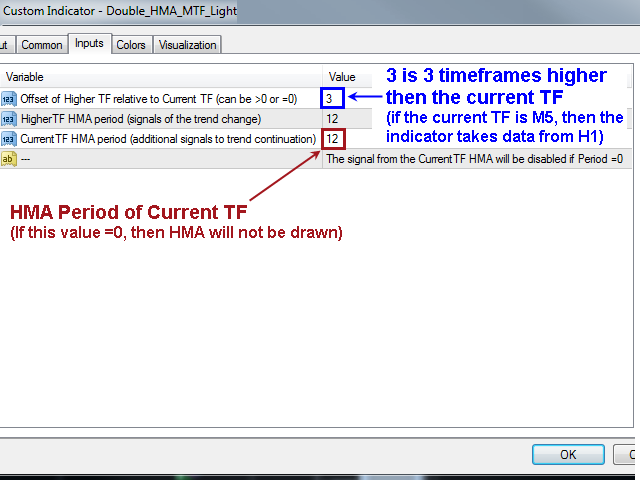 For example, if the current period is M5 and you set this parameter to 1, then the indicator will display HMA data from TF M15, and if you set it to 2, in that case the indicator will display HMA data on TF M30. 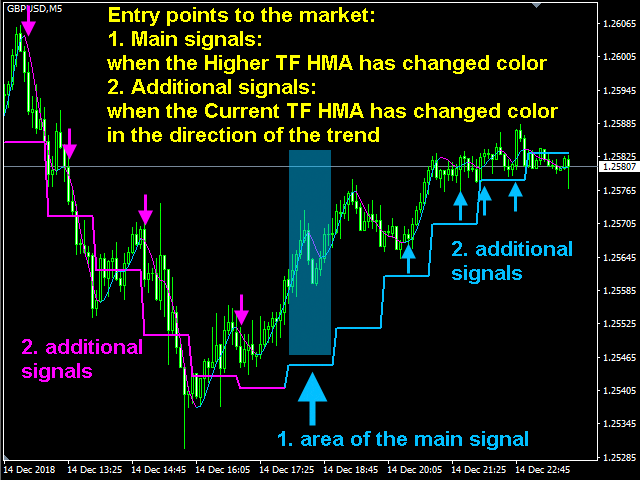 CurrentTF HMA period (additional signals to trend continuation) – the HMA period from the current timeframe (change of HMA color from the current TF is change the direction of the current price movement). If this parameter =0 then the signal from the CurrentTF HMA will be disabled. I like it very much. Thank you Pavel Zamoshnikov. An invaluable indicator for trading with the trend!